The OPRA law provides public entities seven business days to respond. 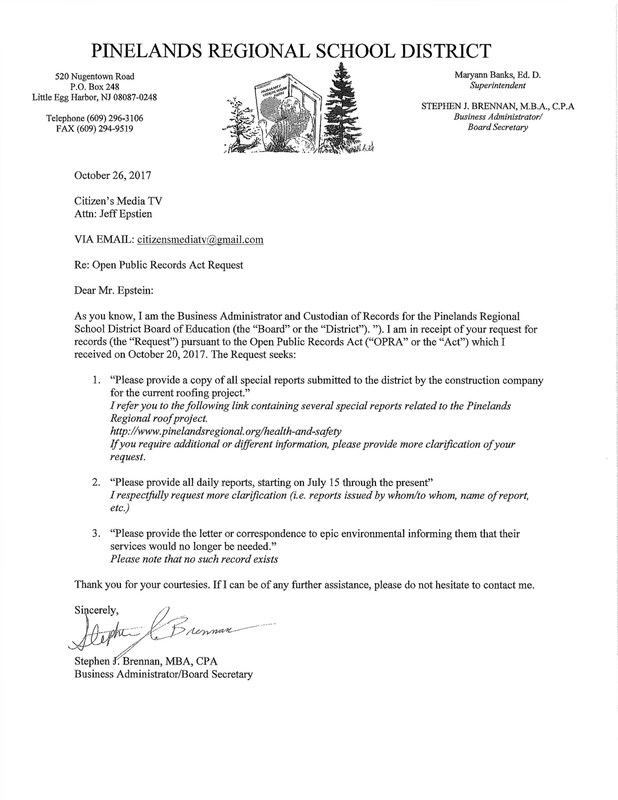 The seventh business day for this request was Tuesday, November 7th. 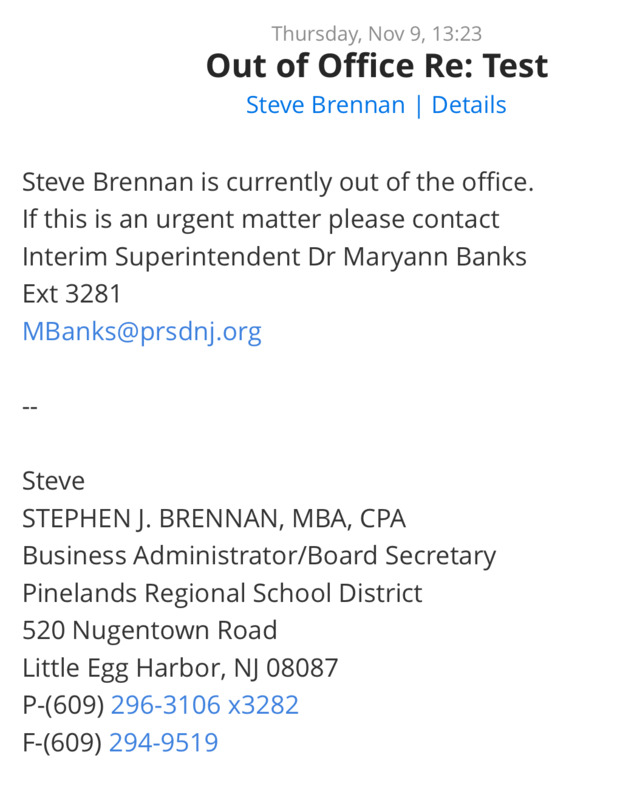 This happened to the same day that District administrator Stephen Brennan, who is also the records custodian for the district, was supposedly escorted out by police, placed administrative leave, and his computer confiscated. Although in our previous requests (of which there were perhaps more than fifteen so far) Brennan generally took the full seven days to respond, he never requested an extension or failed to meet deadlines on our previous requests. Yesterday, we posted this screenshot from Interim Superintendent Maryann Banks. 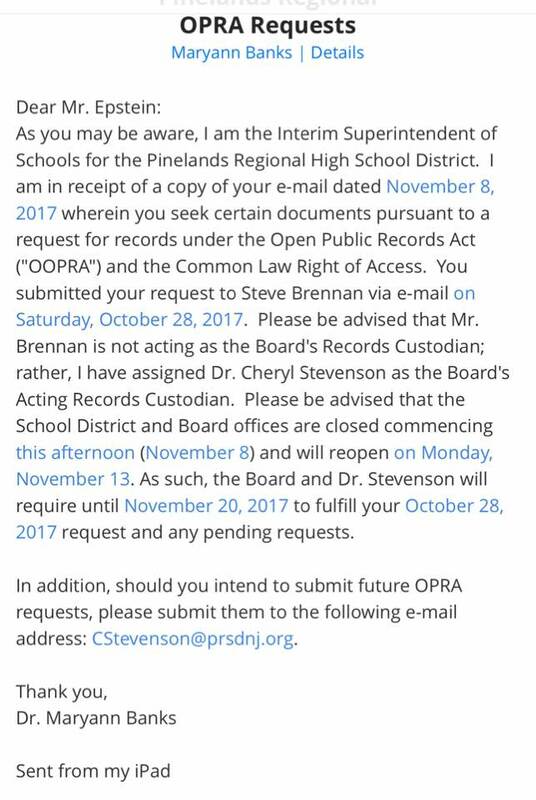 Although a day late, Banks stated that Brennan “is not acting as the Board’s Records Custodian” and that former acting superintendent Cheryl Stevenson has been assigned as the “Acting Records Custodian.” Banks also stated that the district will require an extension until November 20 in order to fufill the request. This is particularly because of school being closed on November 9th and 10th for the New Jersey Education Association (NJEA) teacher’s convention being held in Atlantic City. Finally, despite the rumors about Brennan’s being removed from regular duty, we have so far found no definitive evidence to support this. The only exceptions are that he is no longer the records custodian, and the fact that he missed our OPRA deadline. 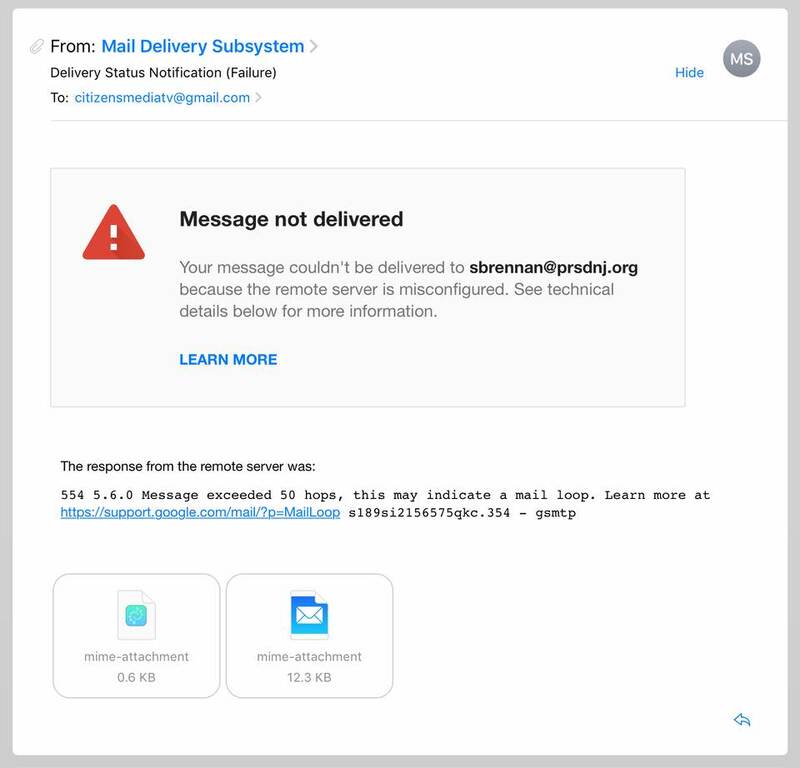 On Tuesday, we sent an email to Mr. Brennan which was bounced back to us as undeliverable. 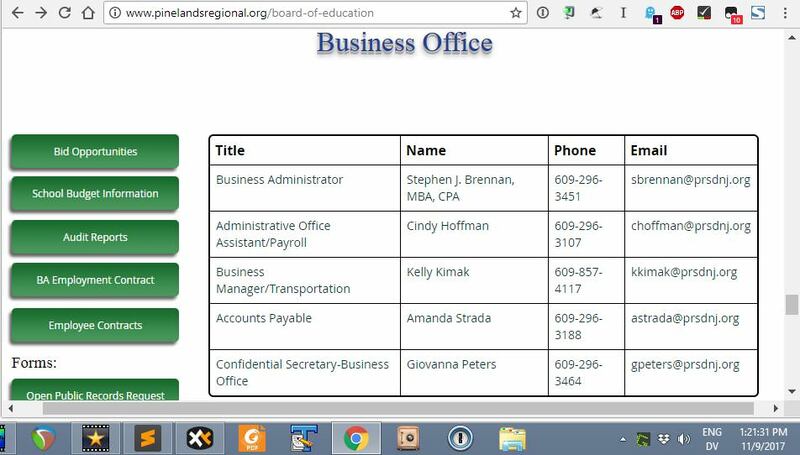 However, on the afternoon of October 9th, he is still listed on the district website, his phone still is accepting messages, and his email is now responding with a “vacation/out of office” message. This is a request for public records in accordance with the Open Public Records Act and the common law right of access. I certify under penalty of perjury that I have not been convicted of a crime anywhere in the United States. – Please provide a copy of all special reports submitted to the district by the construction company for the current roofing project. – Please provide all daily reports, starting on July 15 through the present. – Please provide the letter or correspondence to epic environmental informing them that their services would no longer be needed. Please provide all responsive documents in digital form and email them to citizensmediatv@gmail.com . > If you require additional or different information, please provide more clarification of your request. I am referring to the special reports as specified in the contract under item 2.4.A and B in section 01310. Please provide all special reports in the district’s possession, that are not already available on the health-and-safety website as mentioned above. I am asking for both kinds of daily reports (construction and field quality control), starting on July 15 and through the present. Finally, I would also like to request all electronic and postal correspondence between the district and Epic Environmental between September 10th and October 15th. 1. all special reports that are not already on the website. 2. all construction daily reports from July 15 to the present. 3. all field quality control daily reports from July 15 to the present. 4. all electronic and postal correspondence between the district and Epic Environmental starting on September 10th through October 15th. If you would be kind enough to either put these responses in separate PDFs, or very clearly mark or specify which pages refer to which requests, it would be appreciated.